Our first next continent was Africa where we plan to drive through lots of different countries and see some amazing animals! *All photos in this blog taken by Ethan! 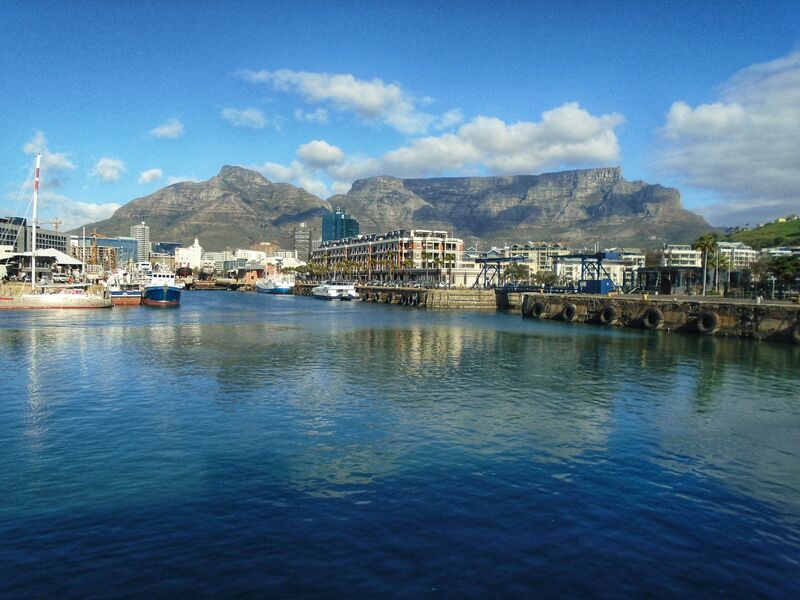 The first stop on the way was Cape town. We stayed there for a few days where we went to an aquarium and saw allsorts of aquatic animals such as sharks being fed by divers, black footed and rockhopper penquins and even a box jellyfish (much smaller than you would expect it to be! 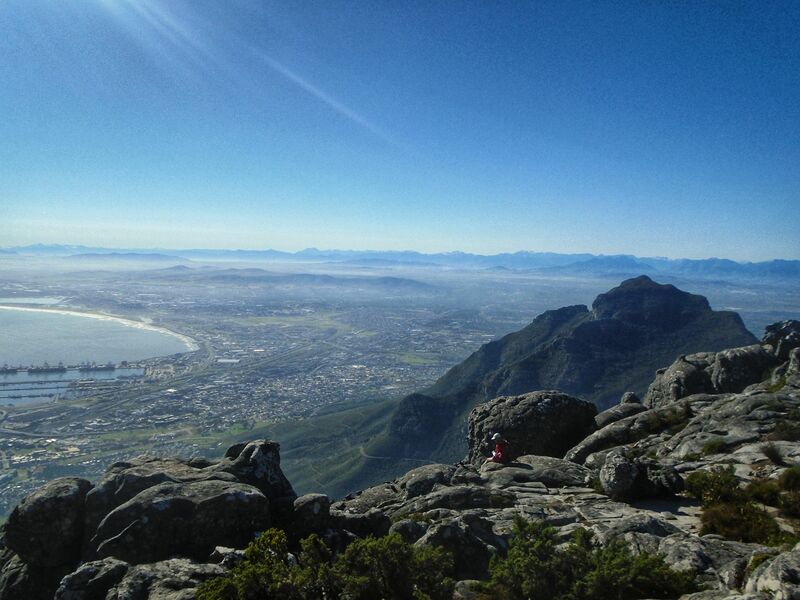 We also climbed table mountain, (trust me you would not want to scale it on a hot day). We had to climb up a gorge to get to the top. We had a hire car so could drive out to see the penguins and hyrax’s at boulder beach, as well as Ostriches and baboons at cape point. After Cape Town we took a flight and flew to Windhoek in Namibia where we were met at the airport by our car rental person, Paul! He took us to our 4WD ford ranger with 2 rooftop tents. We drove to our first hotel, where we stayed for 1 night and then headed out early the next morning to Sesriem Campsite in Sossusvlei. 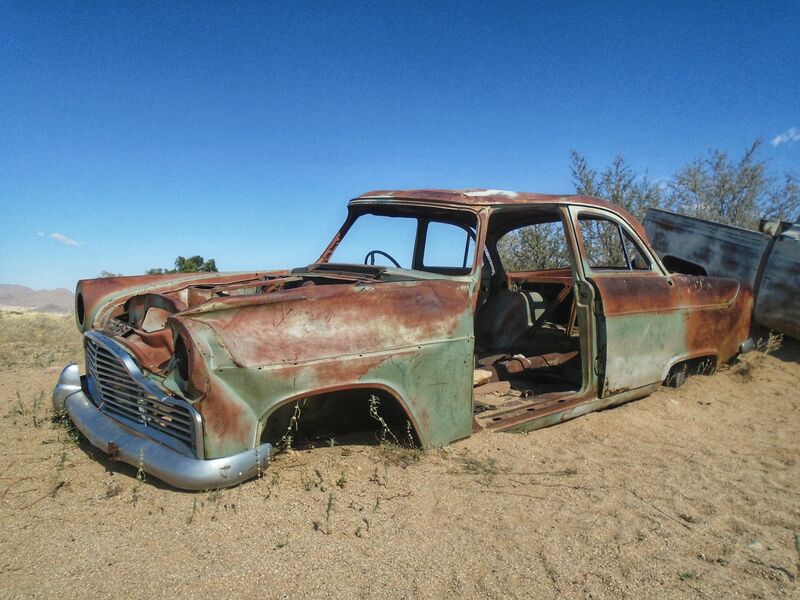 The roads were a bit gritty and bumpy, but all in all – o.k. 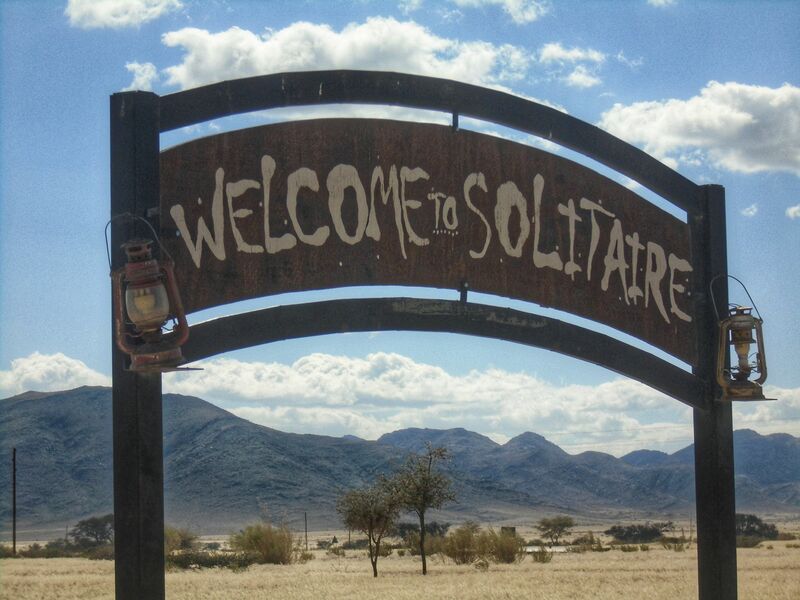 We stopped at Solitaire which we thought was a town but it was just a cafe and petrol station. We ate the famous apple pie, which was my favourite! 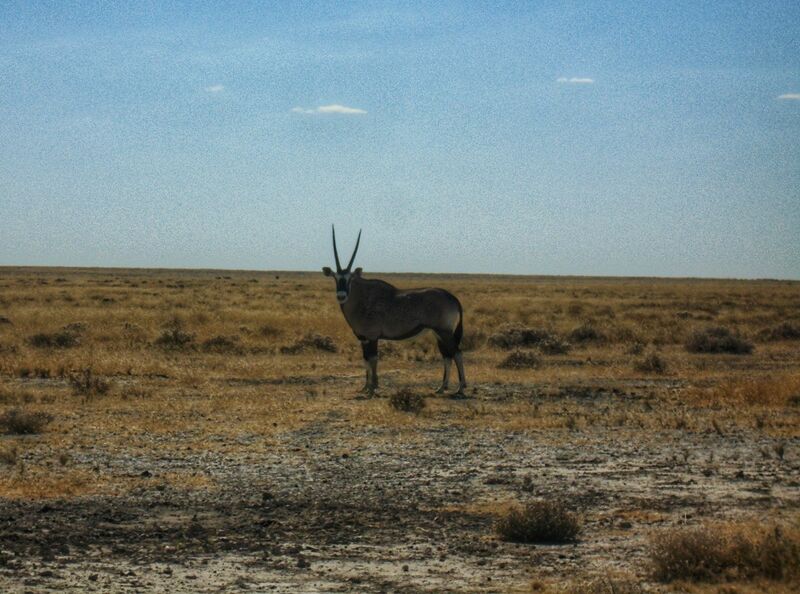 When we arrived at the campsite, we decided to go into the park and we saw our first Oryx. 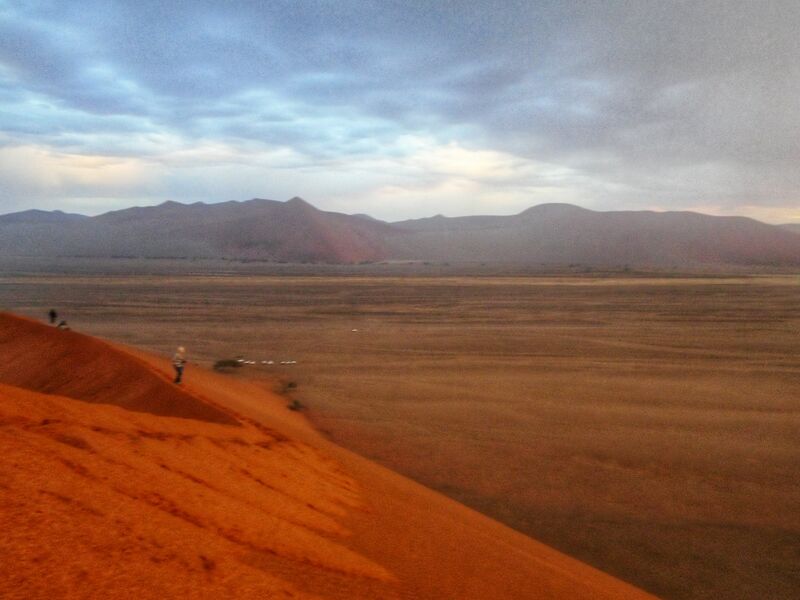 We climbed up Elim Dune to watch the sunset – it was great and ran down afterwards (my favourite part). Back at the campsite we found a scorpion – good job I had shoes on! The next morning we were up very early and went out to climb Dune 45 to watch the sunrise. The weather was o.k. at first but then it started raining, I know in the desert!! Later we walked to the Dead Viel and I climbed up a huge near vertical sand dune! It was tiring but tremendous going back down. 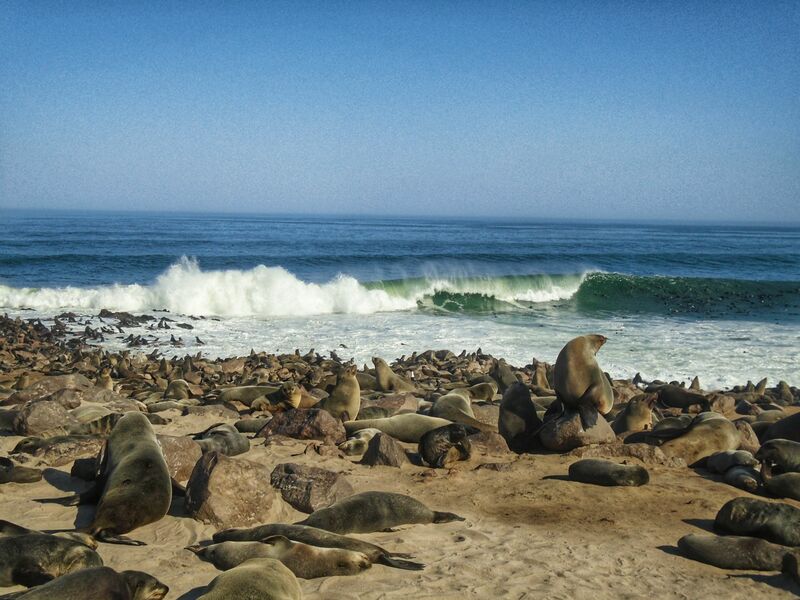 We had another long drive, first we stopped at Cape Cross to see the 100,000 loud, stinky seals. Then we continued our journey to the coast where we stayed for 2 days. The terrain changed suddenly from a vast desert to civilised city. We walked to the beach where we played with the overlapping tides. Dad was taking pictures but got soaked by a big wave! (not wearing swimming clothes – ha ha). 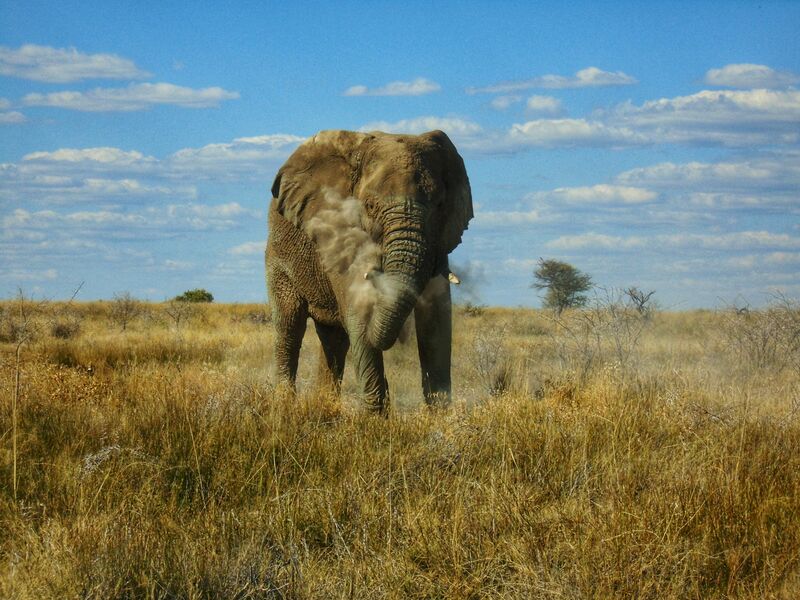 We were driving towards our campsite when we saw 2 cars parked by the road, we pulled in and one of the guys told us there was a desert adapted african elephant in the shrubs. We could just make it out and were so pleased to see one. Me, Jasper & dad were walking around the campsite at night when all of a sudden a worm snake fell from the sky. At first glance we thought it was a centipede and we think a bat dropped it. Later on we brought our chairs out and looked up to the sky and saw the milky way, lots of satellites, southern cross and shooting stars (one was breaking up!). 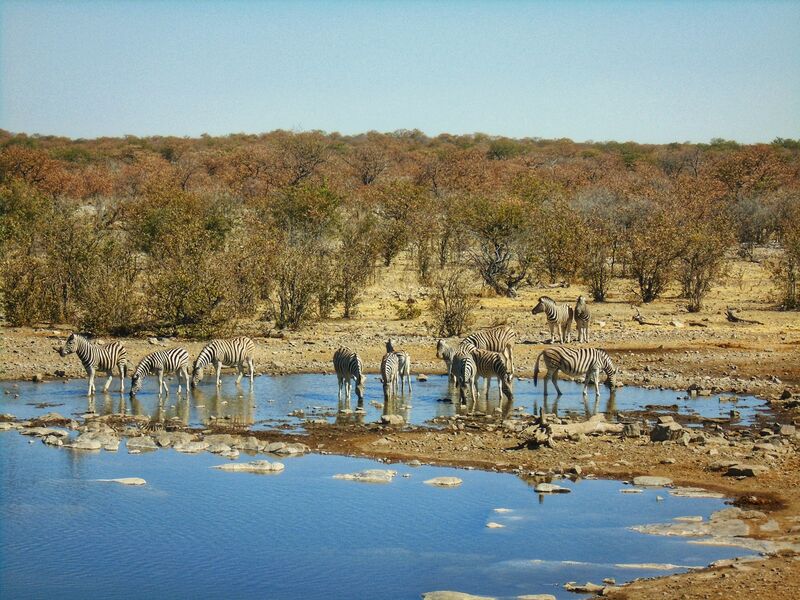 We had lunch at the lodge before heading out to do a quick game drive in Etosha National Park. It was Jasper’s 8th Birthday. 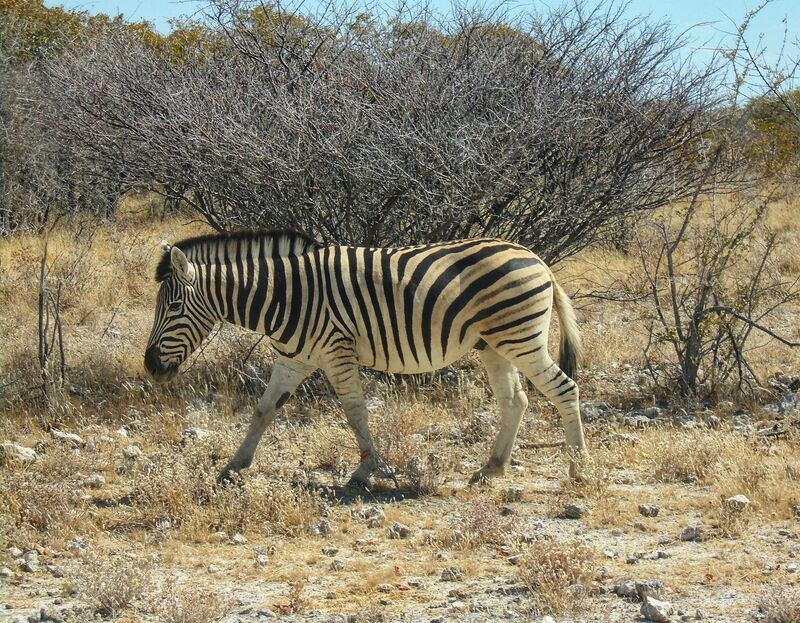 We saw lots of animals such as zebra, giraffes, Impalas, Eland, Wildebeest and Bison. We went back to the lodge and had dinner, which was all sorts of game animals such as Impala, Zebra and Oryx. After dinner the staff sang a Namibian version of Happy Birthday to Jasper – it was very embarrassing for him, but hilarious for us. 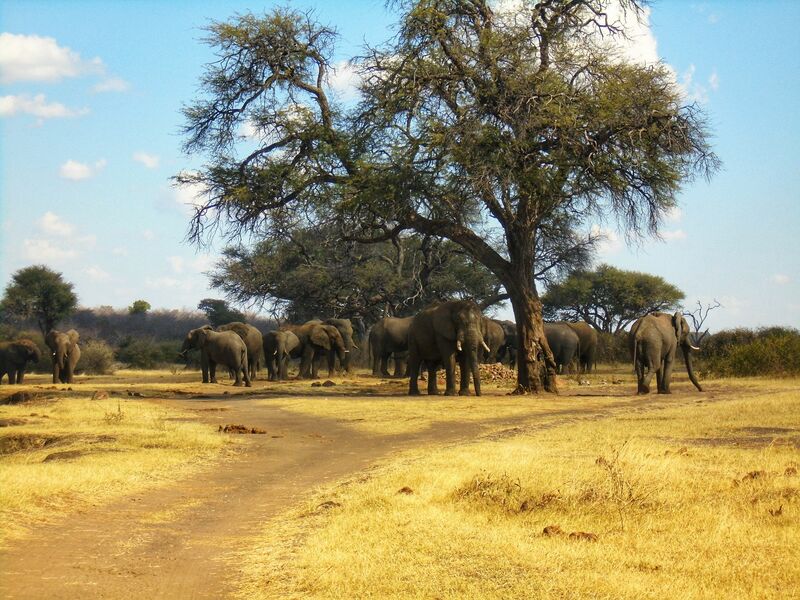 The next day we went out for a full days game drive. 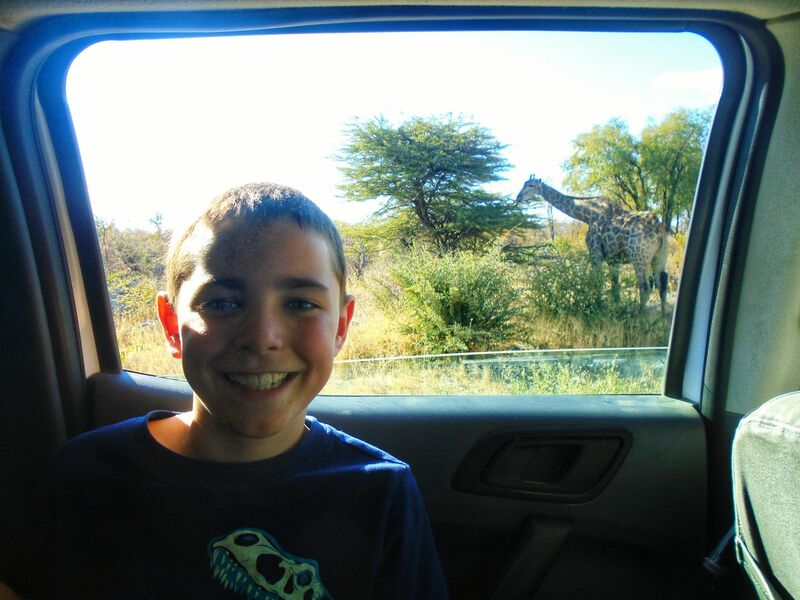 We saw lots of zebra, impala’s, giraffe and even saw a herd of Elephants. 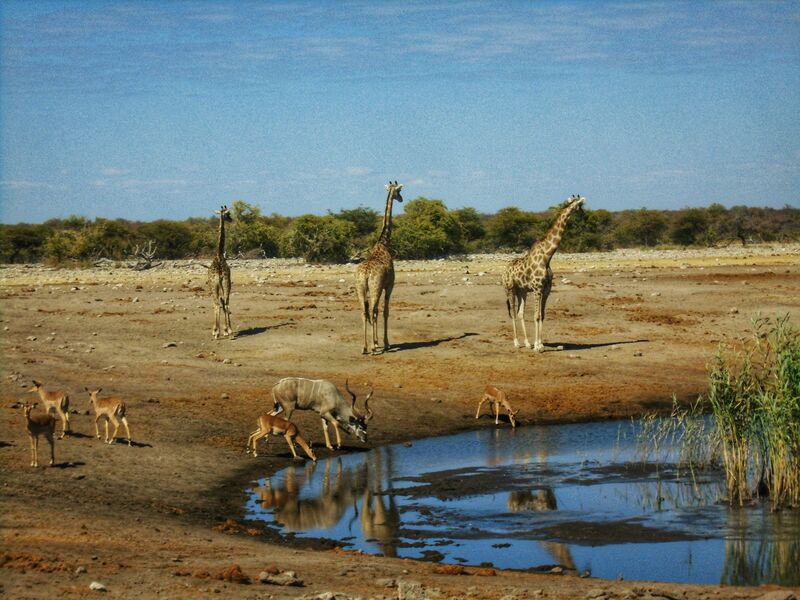 We spent the day driving to several waterholes and were lucky enough to find a pride of lions, including a cub. The lions were just lounging around and most of the animals went along with their normal day! 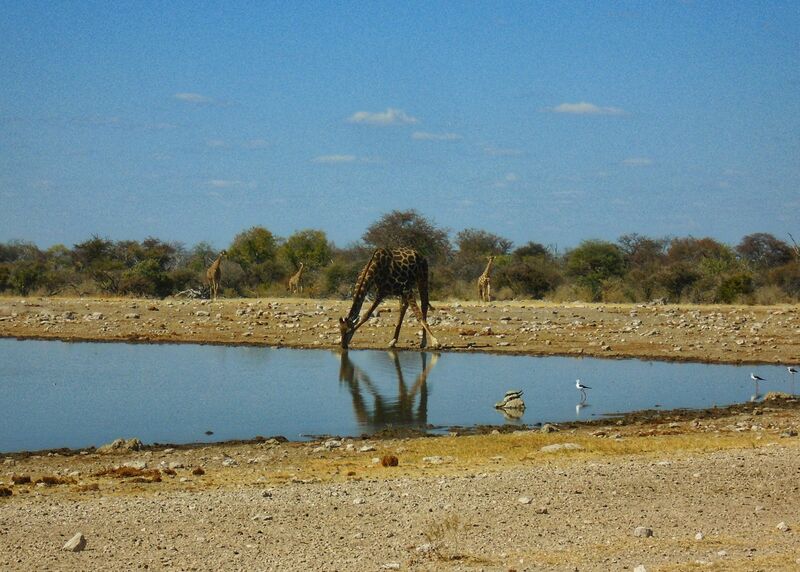 That night we switched back to rooftop camping and stayed at a site next Etosha national park, with a waterhole and a swimming pool. 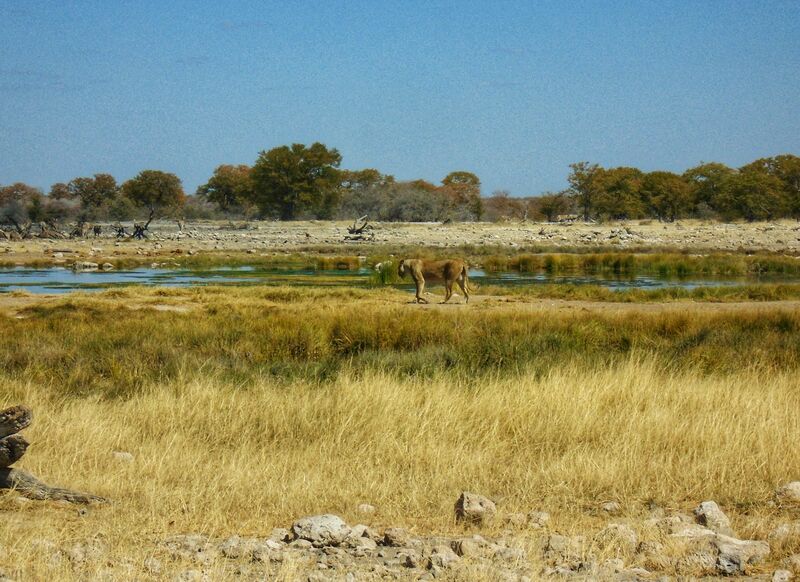 The following day we had yet another drive through Etosha National Park and managed to see a solitary lioness. We also found a hyena’s on a dead giraffe. 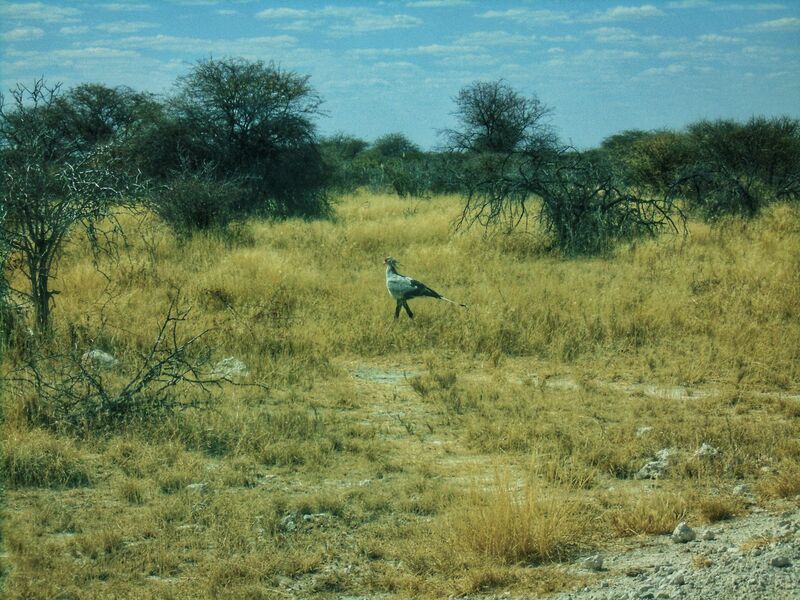 Later on we also saw a group of Jackals taking down an Impala. It was quite grotesque as the jackals didn’t seem to know how to hunt and were tearing it to pieces. We had another long drive to a lodge next to the kavango river. We stayed in a lovely tented chalet on stilts next to the river. 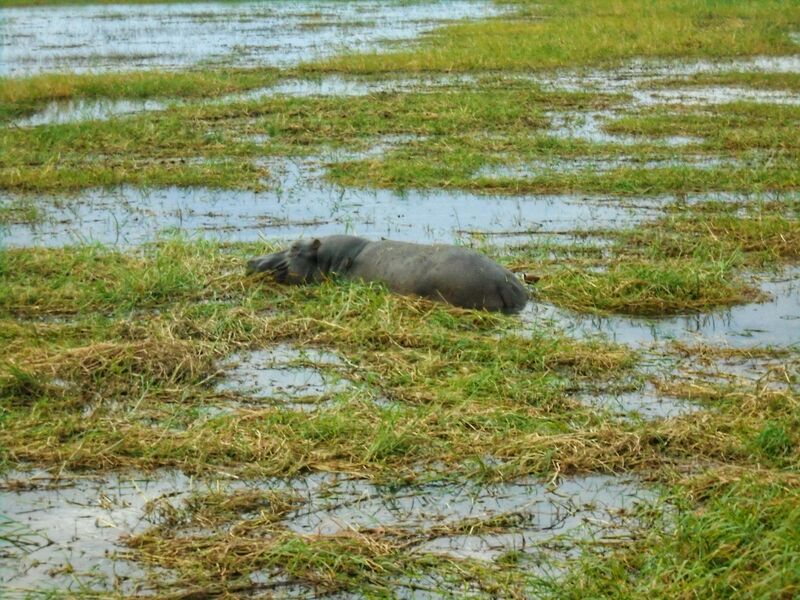 That night when we had our meal we heard hippos in the dark, but couldn’t see them. The next lodge we went to was also next to the river. 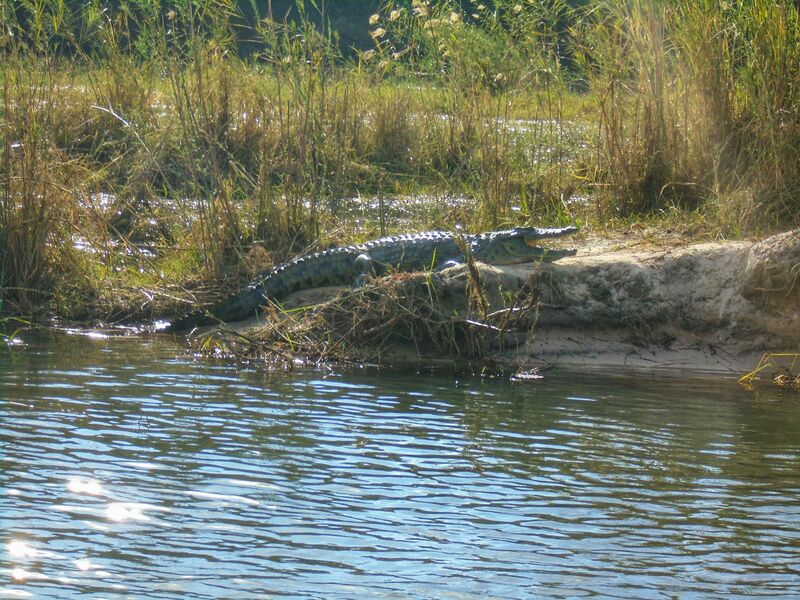 The next morning we went on a breakfast river cruise where we saw our first hippos, crocodiles and even a few buffalo. After the boat cruise we went for one of our last self-drives through Mahangu national park. We were looking for leopards and as we were driving around a corner we saw a skull in a tree, indicating that a leopard had been here. We also saw another herd of Elephants, one seemed to be playing a blue plastic stick and there were a few young males that were fighting. 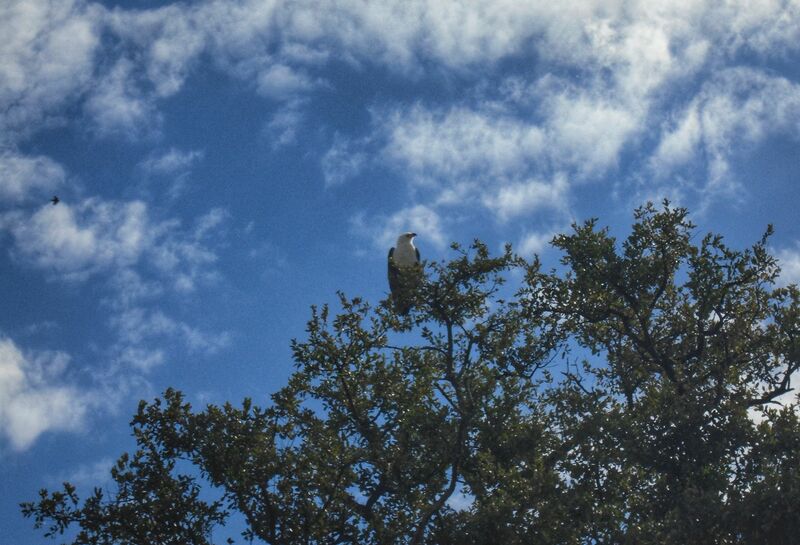 As we were driving out of the park we saw 2 fishing eagles, it seemed like they were fighting for territory. 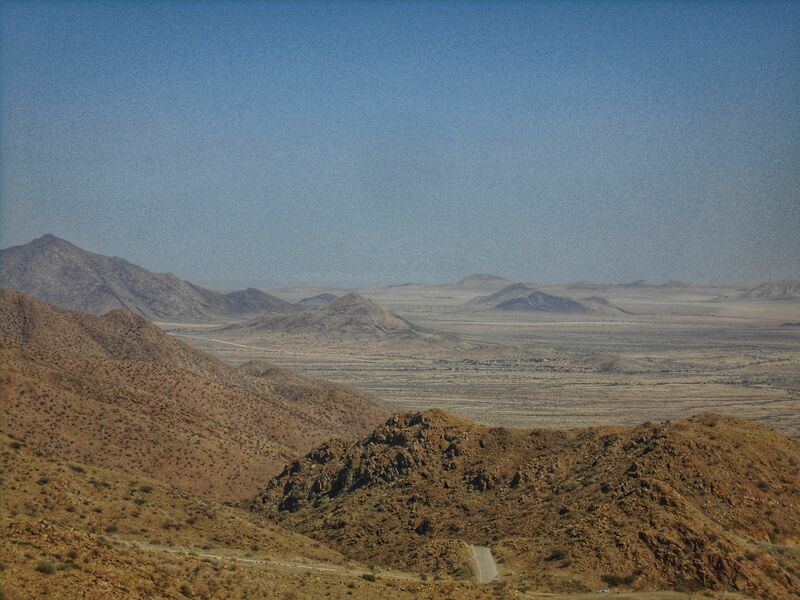 The next place, Camp Kwando, was our last stop in Namibia. Before we set up came we took one last drive on safari to see if we could find any leopards or wild dogs, but unfortunately we found neither. 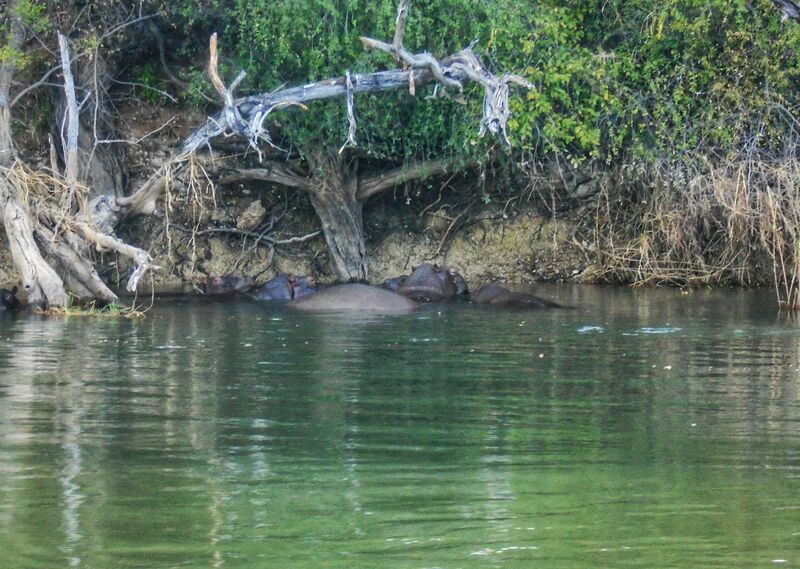 But we did find a hippo pool, but no hippos in it! They were just lazing in a big pile by the riverbank. We went back to camp where Jasper and I made the campfire on our own. Before getting into Botswana we departed from Namibia and got our passports stamped. Then we drove across a bridge and at the border the queue was giant. There was only 2 people processing the visa applications so it took forever! While we were at the Botswana Border a gentleman asked us if we were Skillicorns and showed mum a copy of her passport. It turned out that he was the driver who had come to collect our car. 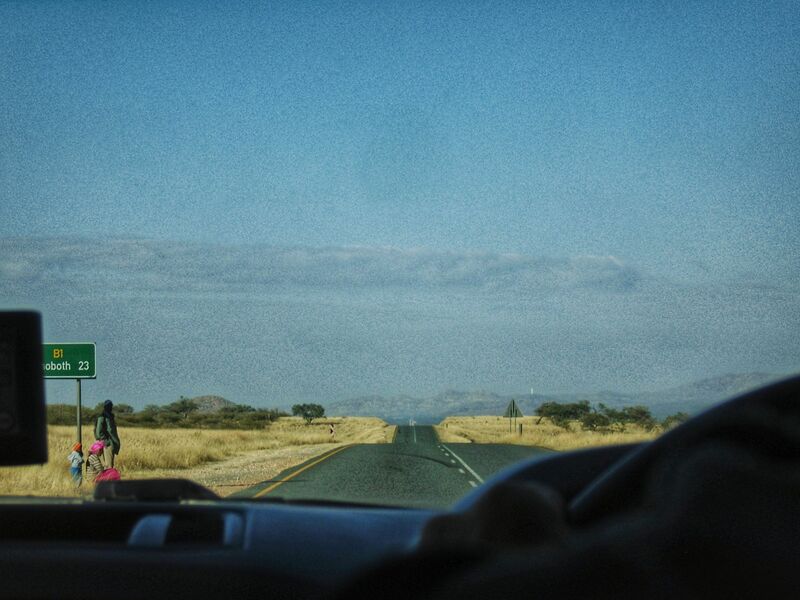 He told us that he’d hitchhiked all the way from Windhoek to pick up our car. So we gave him a lift into Kasane with us. After we arrived at the old house lodge, we were told that we were going onto a river cruise at 2pm and a safari drive at 5.30 in the morning. So we quickly got our things ready and went down to the boat. We spent 3 hours on the boat where we saw Elephants on Impala Island, which is in the middle of the border between Botswana and Namibia. Botswana and Namibia once had an argument about who was going to own the island as it was slap-bang in the middle of the border. So the two countries went to the high court and they said that the border would be in the deepest channel around the island. As it turned out the Namibian side had the deeper channel and so Botswana took the island. We continued the river trip and saw a few boats pulled into the side, so we went in to investigate. 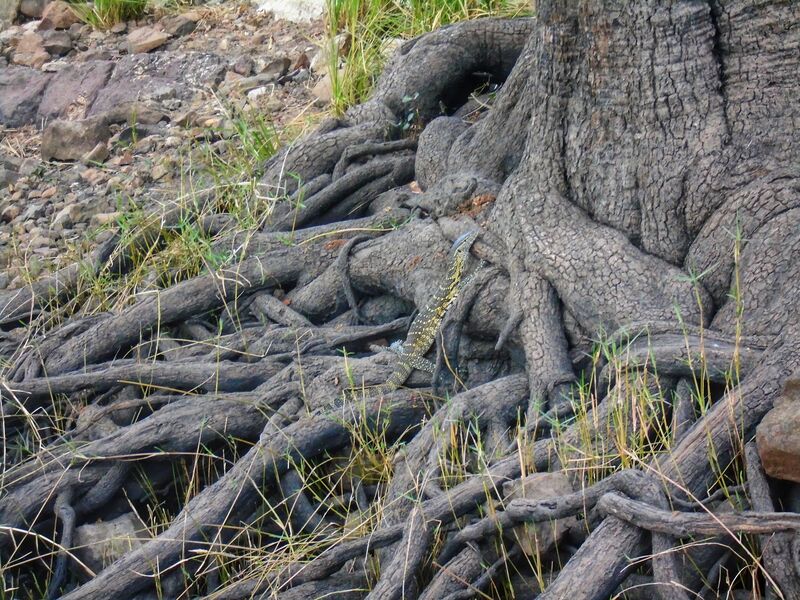 When we got closer we could see that there was a water monitor lizard and a baby crocodile. 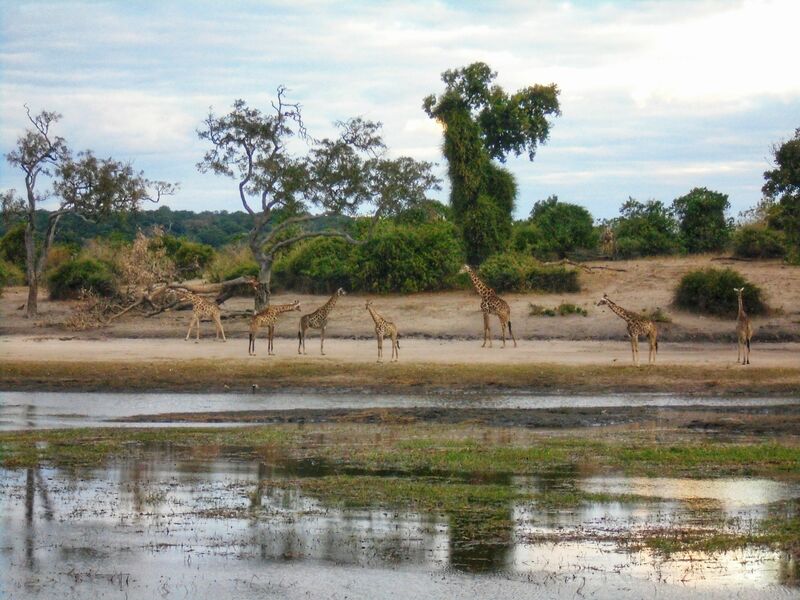 After this encounter we came a little closer to Impala Island which our guide called ‘paradise’. 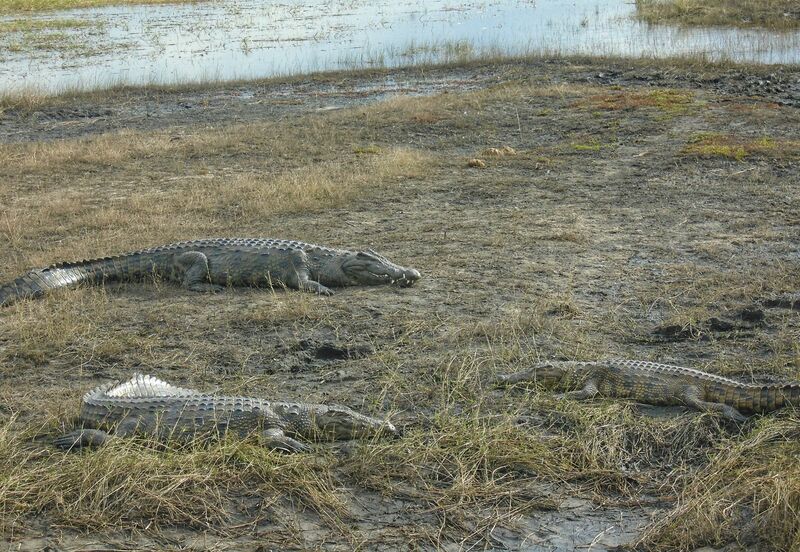 Here we saw 3 crocodiles basking in the sun and lots of hippos popping up and down. We also saw Elephants eating grass by swinging it around to get rid of the mud. As we went further round there were monkeys and Giraffes on the beach at the mainland. Asit started to get dark we turned around and started heading back. 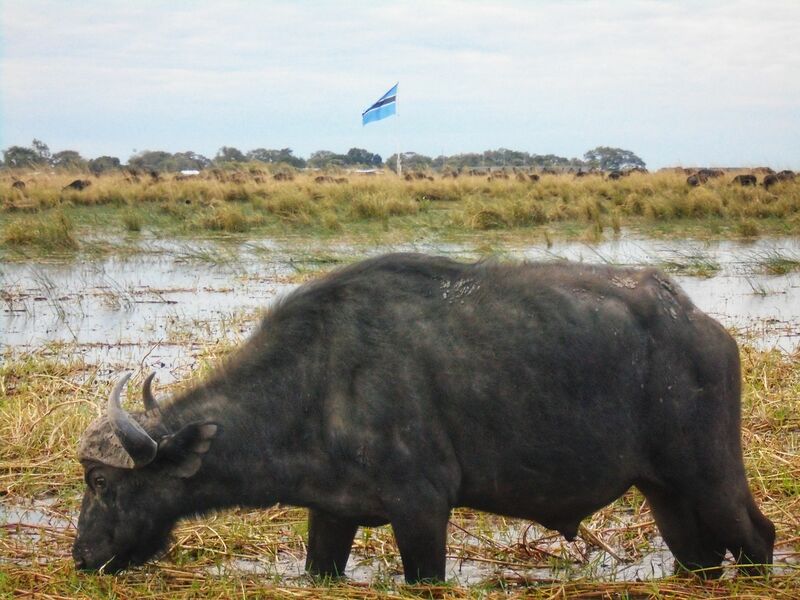 As we were heading back we saw lots of buffalo on Impala Island. While we were looking at the buffalos my dad all of a sudden said to the guide that he saw a big splash. 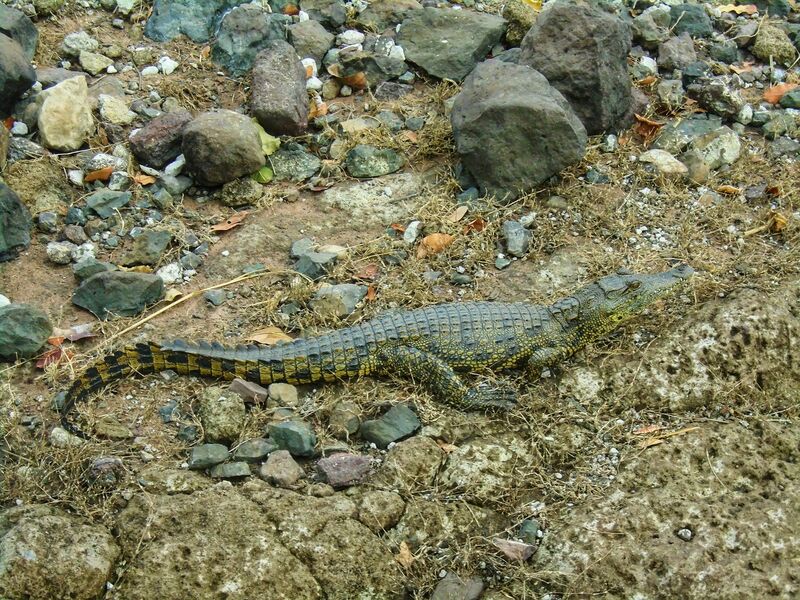 So we went over to investigate and found something in the water and a crocodile next to it. 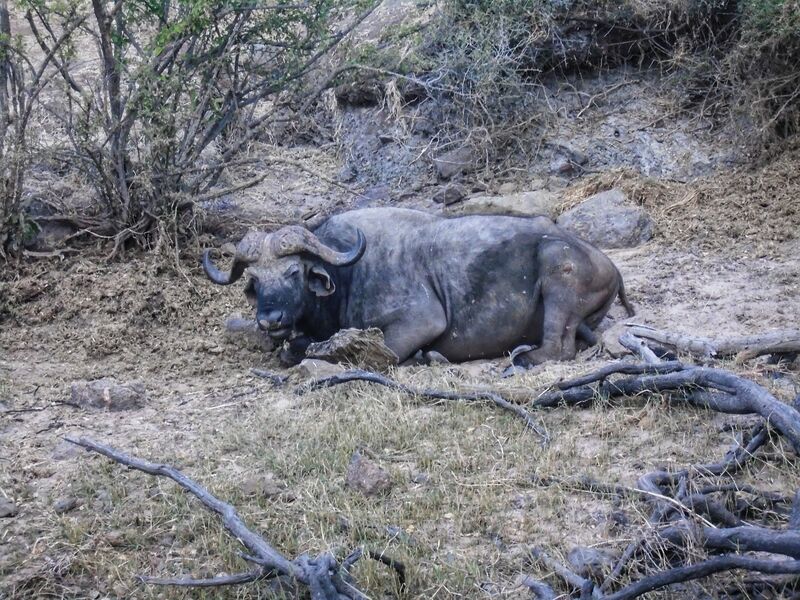 As we got closer the crocodile pulled it down and we saw it was a buffalo head! When we were about 100m from the dock the guide stopped and said ‘thank you for coming – you can swim back now’. The guide was hilarious! The next day we got up very early and went on the safari game drive with the same guide. We needed to wrap up warm and the guide provided us with blankets. We registered at the park, it was extremely busy. As we got into the park and the sun came up, we saw a giraffe skeleton and all of a sudden an entire herd of impala came racing towards us at full throttle. The guide got his binoculars out and started scanning the area but we couldn’t find what scared them. As we went round we saw 2 jackals playing around, but we thought it wasn’t the jackals and something much bigger like a leopard scared them! On the way out, there was 5 or 6 vehicles all stopped and were looking at the hillside. Our guide asked what they were looking at and the other guide replied ‘there’s a lion!’. We took our binoculars out and we spotted a male lion a couple of hundred metres away. We crossed the border into Zimbabwe and planned to stay 1 night at our final lodge. This was the end of our safari tour. The next morning we moved into a backpackers where we lounged around and relaxed for the rest of the day. 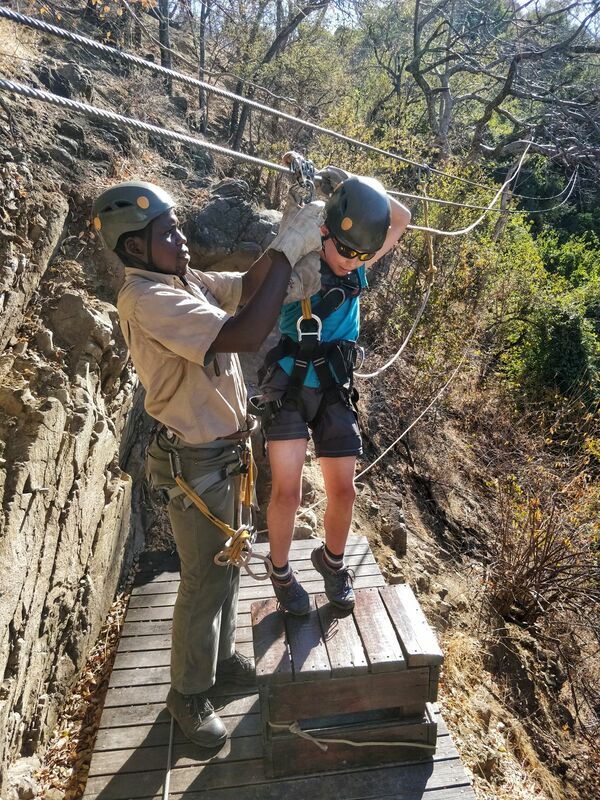 The day after we went ziplining across Victoria falls gorge and we could see bungee jumps, white water rafting, sheer cliffs, and 1 or 2 flying foxes. 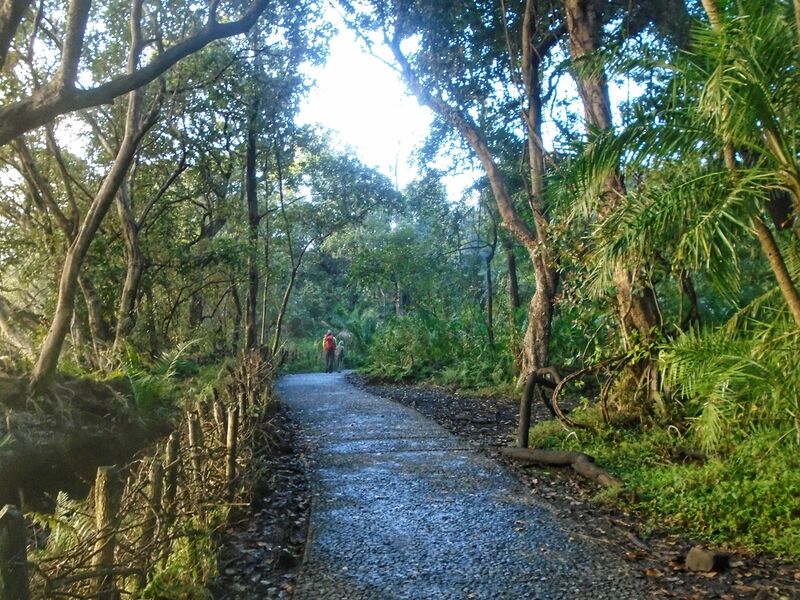 The ziplining was amazing but the first one I had to pull myself up because I stopped too soon – ha! There were 9 ziplines, the shortest was 45m and the longest was no.3 which was 80m. 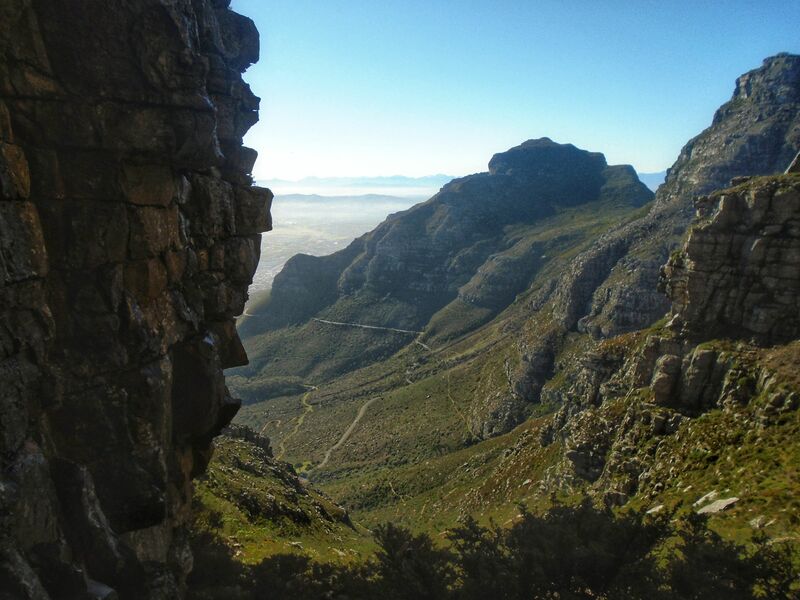 None of them were scary but the views were astonishing looking across to the horseshoe shaped gorge. 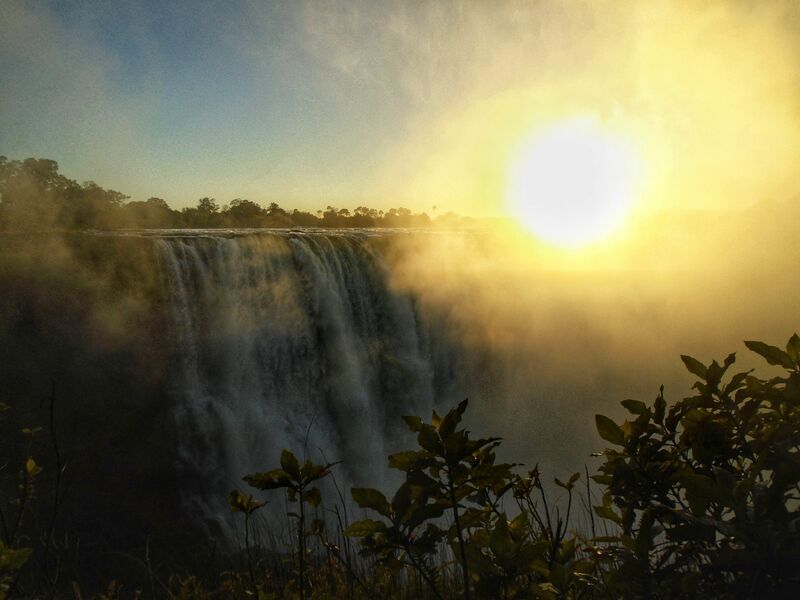 For our last day in Zimbabwe, we walked to, and around, Victoria Falls National Park. We got there early in the morning to watch the sun rising. 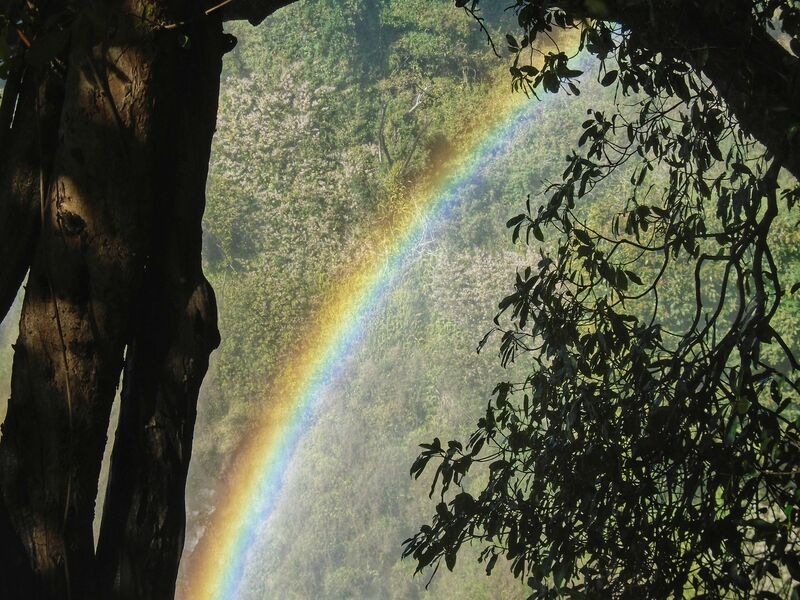 It was magnificent seeing the sunlight reflecting off the droplets of water. 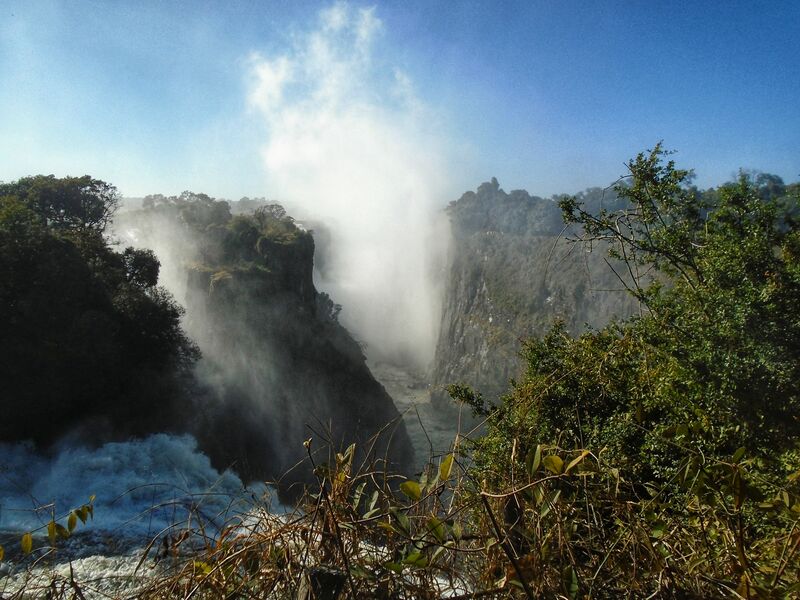 The sound was deafeningly loud as the water fell into the Zambezi river. 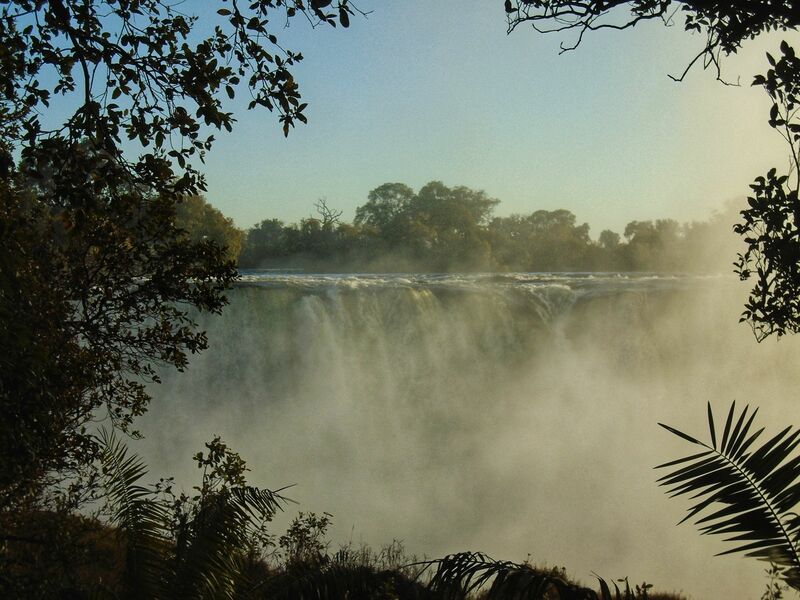 Victoria falls is one of the 7 natural wonders of the world. There was also a smaller stream running off the edge, called devils pools where at the right time of year people can sit at the edge of the waterfall with no restraints! All out, Africa was definitely my favourite continent so far. 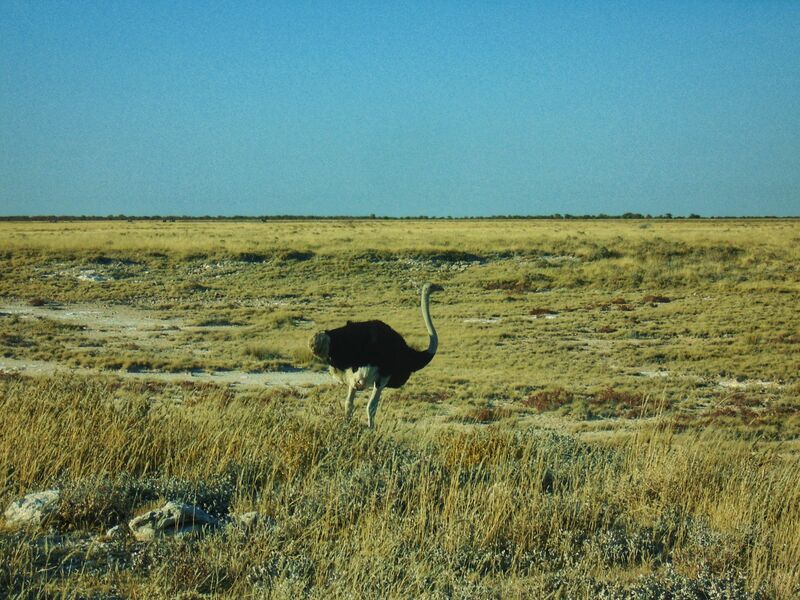 Some of my favourites were Etosha and Chobe National Parks because of the sheer number of animals and all the different textures and landscapes. The people in Africa were very, very nice. I would definitely come back and if you get chance you should definitely go!